This device has a dial format, spring-type function that will allow you to change the setting without even changing the valves. To monitor the pressure, this has a visual indicator that will guide you all throughout the cooking period. This is truly energy efficient and as the manufacturer, Fagor has been awarded with environmental stewardship, you can be assured that its product like this one is a certified environment friendly. So if you want to be a part of the green revolution then purchase products from companies like Fagor. In my search for a product that would meet my needs best, I stumbled upon Fagor Duo and thought about giving it a try. When I looked at its features, I was automatically lured by the amount of materials I can have by buying a single product. 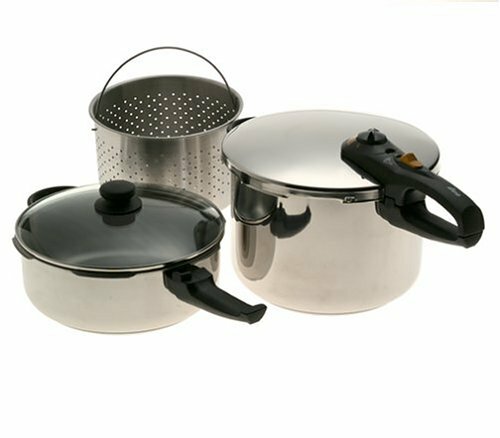 It is a 5-picece pressure cooker set that obviously sets it afar from the traditional and very common pressure cookers. It’s like different pots and cooking wares rolled into one. If you talk about its features further, you will never be frustrated as things about it just gets better every time a new feature’s revealed and tried. This feature will allow you to save a massive amount of energy and will provide you that ultimate convenience in cooking wares as well. It has a 4-quart pressure cooker that can also be used as a saucepan and the 8-quart cooker that can hold the pasta basket that is best in draining pasta and vegetable steaming. This great feature will allow you to change the setting of your pressure without changing valves. This is just another feature to rejoice about. Durability is what this speaks of so you can be assured of being able to use this for a long period of time without any worries of rust and corrosion. All these are features you would want your pressure cooker to have. And the automatic pressure release is just something that you must always look for in a pressure cooker. This will prevent the common explosion that old pressure cookers were known for. With this, safety in cooking is always ensured. The Fagor mission is to preserve the environment and save energy by offering efficient products that consume less and save money. Workers are offered environmentally friendly working conditions and safe handling of hazardous materials. Consumers are offered efficient products that reduce energy and water consumption. Entirely, the product is a very good buy, from the features down to the items you can get in one amount. It is said to produce amazing foods, so primarily food texture is never a problem. The only concern about this though is that it only comes with one glass lid to be used for both pots; given this feature, you surely will not be able to use them both at the same time. If you plan to cook 2 meals at one time then you must get another pot or wait until you are done cooking on the other one. Nonetheless, this is a small concern that does not totally bring down the value of what this pot can offer. Fagor is herald as one of the least expensive manufacturers of pressure cookers that now provides all the modern features and technology offered. It is said to reach an actual pressure of 15psi which many other brands don’t. The 15psi guarantees quick cooking and delicious results without burning. This set has been used for everything from chicken, beef and pork to all types of vegetables with results that more than meet their expectations. Several stated that upon purchasing the Fagor Duo Combi Pressure Cooker Set that it has become the most used appliance in their home. The two separate pots make cooking different quantities of different foods an easy task. The convenience of a quality meal in a short amount of time is what attracts most buyers to the Fagor Duo Combi Pressure Cooker Set. Even novice users that had never used a pressure cooker before found using this pressure cooker set very easy and safe. Buyers that were upgrading from a digitally regulated pressure cooker were very pleased with their Fagor Duo Combi Pressure Cooker set. 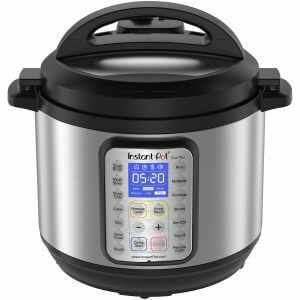 Specifically, one major turn-on about this is its very affordable price despite being one of the top-rated pressure cookers in the market today. Fagor simply lives up to the principle of providing consumers the best for a minimal amount of money. Another feature that gave this pressure cooker its major compliment is the pots that come along in one buy. Many have been pleased to have both pots with which one is suitable for being used as a saucepan and other related cooking; the other in boiling or cooking a larger quantity of foods, including its ability to accommodate a pasta basket that will allow pasta cooking a breeze and steaming vegetables that is simply awesome for people who want to keep the value of the foods being cooked. With all the positive reviews of performance, quality and ease of use, we simply would have to recommend the Fagor Duo Combi Pressure Cooker Set to anyone looking for a best pressure cooker. The dual pots and easy safe functions make this product a sure winner with cooks everywhere. Fagor Duo Combi Pressure Cooker Deluxe 5 Piece is certainly a pressure cooker to buy. It has features that will make you be very thankful of having a pressure pot for the least amount of money. On top of that, the fulfilment of being able to help the environment through energy saving is unparalleled.